More walking on the 7th day. And proof on the left that the distance was far enough to cause some damage. My friends Alex and Nathan got married yesterday afternoon. I left work early and despite planning ahead to wear my black patent leather Dansko clogs to the hotel and bringing my higher platform-y Mary Janes, I decided that I could hoof it the whole way from my office (8th & Stewart) to the W Hotel. 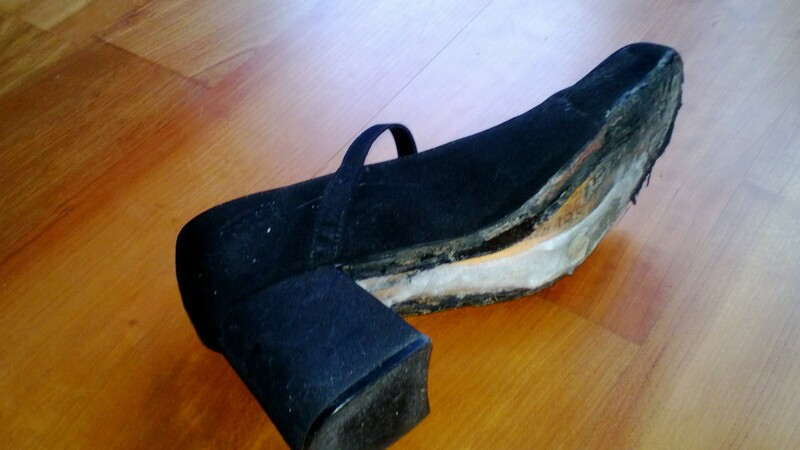 I’d recently repaired my old-ish Mary Janes, applying a nice layer of super glue to the sole of one shoe to ensure the platform was secure. It was secure, just not enough to endure a brisk 30-minute walk to the W (made longer because I forgot the W was on 4th and not 1st), including a few steep hills. Sigh. At least 30 minutes of walking in? Yes, definitely. And dancing after dinner at Pink ultra lounge downtown. The DJ didn’t take requests, though he didn’t say that. A pet peeve of mine, especially when celebrating a wedding. We heard that Pink is closing this weekend, actually, and that’s not surprising. The company (wedding party) was fabulous and we had tons of fun as a result. But the bartenders weren’t very friendly or very into customer service. I just hope Alex and Nathan had a great night. I think they did. Next up: Yoga at Samadhi. 90 minutes of a workout today. Looking forward to it.